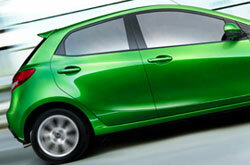 You can find a complete 2013 Mazda Mazda2 review below the video. With the help of automotive writers, Reliable Mazda put together some of the finestMazda Mazda2 reviews you'll find anywhere. The following article is packed with essential information- it contains everything so that you can make intelligent decisions about the Mazda you want to buy. Get started by watching the video below or move on to the full review. Comparing the 2013 Mazda Mazda2 head-to-head with against vehicles like the 2013 Kia Rio, Honda Fit and the Ford Fiesta, and you will find that the 2013 Mazda2 ranks above the competition in quite a few areas. Check out our bullets to see why! You won't get Mazda trained service techs, a year warranty on service and genuine Mazda parts at a national auto facility in Springfield, so visit Reliable Mazda instead. To keep your Mazda in premium physical shape, put it in the hands of Reliable Mazda's auto repair buffs. We take care of a wide range of repairs: from challenging, time consuming endeavors like shock and strut maintenance to effortless stuff like front and rear brake pad replacement and customary multi-point inspections. It's easy as ABC: If you want buffs service and budget repair prices in Springfield, make Reliable Mazda your first stop for Mazda vehicle maintenance. Follow the link below to see our current service specials.